The RUST server description is a RUST server setting that can be configured and modified by server owners and admins. Its primary purpose is for server owners to provide a short and limited description of their RUST server. While in the server browser, it’s most common for players to view the server description before joining. 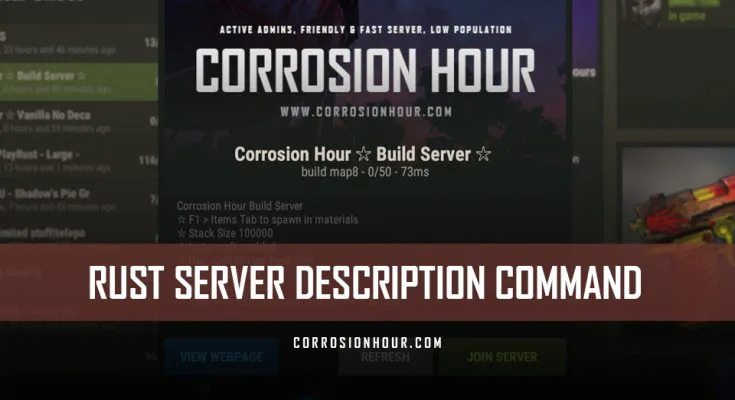 The server description should be tailored for potential players, as they use the information to learn more about each server and make decisions on what server’s to play on. It weighs heavily and is a critical factor in players’ decisions in ultimately joining a server. Appearing directly below the server header image, the RUST server description can be viewed after a player has single clicked on a RUST server name in the server browser. A small dialog window will open up, displaying the server’s header image, server name (hostname), a server description, along with a few action buttons. RUST server owners can use the RUST server description to their advantage to help attract players into their server community. By providing critical information about their server, such as how it operates and what makes it special can help it stand out. 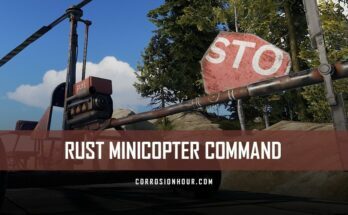 The RUST server description is one of the first items players will see about a server and so it should strive to make a good first and lasting impression. It’s important to utilize the space allotted in the server description. Be sure to display information that RUST players are looking for and most importantly, expecting to be there. The server description is arguably the best chance server owners have to entice players to join their servers. Think of it like an advertisement that tells RUST players exactly what the server is really about. Take the time to spell out what separates it from the many thousands of other servers. 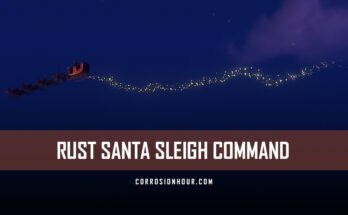 The RUST server description is a command and server variable that can be set in a startup file, configuration file or issued through a command line console by RUST server admins and moderators. Non-admin players do not have access or the ability to set and modify a RUST server description. There are two primary methods for setting, modifying, or removing the RUST server description. Each method has it’s own pros and cons. Enter the server description command, listed below, into the server console, in-game console, or RCON console. Using this method, any changes to the description will take effect immediately. Keep in mind, this method is temporary. The server configuration file is not written to using this method. Open and modify the server.cfg file directly, which is located in the following directory. Using this method, the description will be updated upon the server restarting. Keep in mind, if the server restarts for any reason, it will re-read the value from the server.cfg file, making it the “permanent” solution. This command is used to set and modify a custom RUST server description. There’s no default server description value provided for Vanilla servers. Server providers sometimes add their own advertisement as a default, so be sure to remove it. To create a new line, use \n inside of the description text where you want the broken line to appear. There is an on-going bug in which a server’s description will be over-written with a series of numbers at a random point in time. Restart the server, so that it reads from the config file to correct this. server.description: "Last Wiped: 9/1/1935\nVanilla server, with Active Admins\nMap Size: 3.5k\n Monthly BP & Map Wipes"